Top 10 Wedding Etiquette Rules For Guests | Shoot & Share | Helping Photographers Book More Clients. Download the Top 10 Tips For Wedding Guests in an easy to share PDF here! 1. The bridal suite should be OFF-LIMITS! — Sorry, ya’ll – no exceptions here. We know that Aunt Betsy just loves the bride to death & wants to come see her before the ceremony – but honestly, sometimes uninvited visitors can put unnecessary, extra stress on the bride before the day even gets started. Mom — we love you too — but try to refrain from inviting long lost cousins that your daughter hasn’t met yet into the bridal suite. Instead, enjoy the last few hours of your babygirl before she becomes a married lady. She has a big day ahead of her & the stress levels should be kept at a minimum! We know that family is EVERYTHING & no one wants to be rude to a fellow family member – but sometimes, it’s just best if the group in the bridal suite is kept to a small group. Our tip – ask the bride BEFORE the wedding day who is & isn’t allowed into the bridal suite. Anyone who tries to come & visit – just give them a friendly reply that the bride can’t wait to see you after the ceremony! PS – Also, to add to this little tip – the MOH (Maid of Honor) or someone who is responsible can alleviate any stress by taking the brides phone to answer any phone calls from random people who will be bombarding her with questions regarding the day. It will be a huge stress relief for the beautiful bride-to-be & she will appreciate your help so very much when it comes to this! 2. Send in your RSVP & do so by snail-mail! There’s nothing more frustrating than when a bride & groom are trying to get their guest count & RSVP list correct than by having to check a million different avenues to try to find your reply. They spent a lot of time & money on those gorgeous invites & they expect you to use them! 🙂 So, refrain from sending a Facebook message or text to let them know you are coming or not & take 30 seconds out of your day to mark your RSVP card & pop back it in the mail. 4. DO NOT WEAR WHITE! (& definitely don’t dress to compete or steal the show!) I truly don’t think anything irritates me more on a wedding day (except Rule No.8 which you will get to soon) than when a female guest wears white. *Insert long & dramatic eye roll here* It’s a given…and if you need me to, I will give you the change of clothes I carry in my car. Trust me – it’s that bad! 5. Speeches should be short, sentimental, sweet & funny. I personally would say no longer than 3-4mins MAX! Of course, there are some exceptions to this rule, but not really. We know how much you love your best friend and how you have had a gazillion drunken crazy stories that can be used as blackmail – but trust me, we will live if we don’t hear them all during your speech – save those stories for your next night out together! 😉 There’s nothing we love more than a hilarious, short & sentimental speech! 7. Mail your gift. It has been a LONGGGGG day for wedding planners & close family members after the wedding comes to a close. Don’t forget that most of the time, they have to stay around after to help breakdown the decor & etc. The last thing they probably want to do is tote heavy gifts out to their cars to give to the bride & groom later. So – our tip is to mail your gift to the couple – it’s a win/win for everyone! 8. Go Unplugged During The Ceremony. (This should be rule No.1) I could say a million things about this rule right here…but I will leave it at this: There’s nothing worse than looking through an iPhone screen rather than enjoying the moment and being PRESENT! 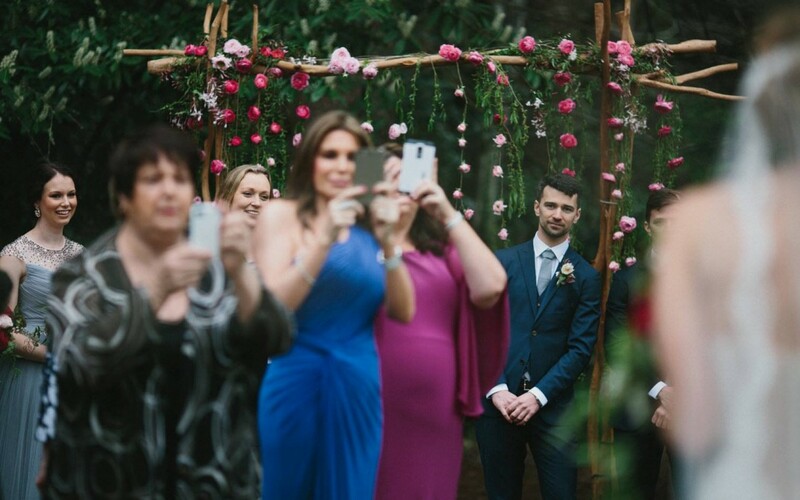 Also, there’s nothing worse (or sad) than seeing everyones faces covered by their phones during the ceremony. Or covering the GROOM from seeing his bride for the first time just so you can get your cruddy iPhone shot. JUST STOP! Stop.It.Right.Now. We know you adore the bride, but that’s what we’re here for – we promise to capture the pictures so you can relax & enjoy the couples ceremony. 9. Double check before you bring a plus 1. As you know, it takes a lot of money and time when it comes to planning a wedding and budgeting for hundreds of people. That includes seating charts, food, open bar & etc. If the option to bring a “Plus 1” wasn’t noted on the RSVP card – go ahead & assume that you shouldn’t bring a guest. Also – please refrain from calling the bride to ask if you can bring someone. Can you imagine if 100+ people were calling her to see if they could bring a date? Yeah, I just got anxiety thinking about it too. They probably quadruple checked over their RSVP cards and if wasn’t listed, I’m 99.99999% sure that was intentional. (This also applies to assuming you can bring your kiddos & family!) See if you can find some friends who are going & have a blast with them for the night! 10. Arrive on time. If you’re not early, you’re late. Yes, I may be a little too punctual for my own good at times and arrive an hour early usually…but better to be early than late. I believe that guests should arrive no later than 15 minutes before the ceremony starts. There’s nothing more rude than sneaking in right before the wedding party walks down the aisle or mozy-ing up mid-ceremony. Be punctual & respectful. The bride & groom may not see it…but I do…and so do all of the other guests. Well, guys! That concludes our Top 10 Wedding Etiquette Rules for Guests (That You Can’t Live Without)! If you have any wedding etiquette rules that we haven’t listed, please share them below in the comment section! Also, we can’t wait to see you at the next wedding rocking proper etiquette! PS – Don’t forget, if you loved this article, be sure to share it with your fellow wedding-goers! We’re Chandra & Daniel – a husband + wife photography team who loves shooting beautiful moments all over the world! We are loving life together in Texas with our sweet fur-babies, Maggie & Charlie. We love Jesus, the little things in life, Jalepeno chips, sipping coffee together in the mornings, traveling, channeling our inner Joanna Gaines, sitting on a patio when the weather is lovely, spontaneous road trips & above all, building genuine relationships with others & spending time with our family & friends! We are in love with love & are so blessed to be able to live this life that God has given us! Be sure to follow Chandra!